…And if America is to be a great nation this must become true. So let freedom ring from the prodigious hilltops of New Hampshire. Let freedom ring from the mighty mountains of New York. Let freedom ring from the heightening Alleghenies of Pennsylvania! 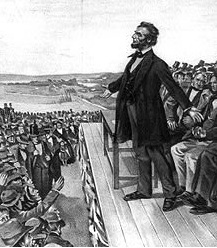 In a similar manner, Peter Norvig created a presentation for Lincoln’s Gettysburg Address on 19 November 1863. Now, it’s not strictly fair to blame Powerpoint and the culture of jargon-filled, soulless presentations which emerged through the 1990’s and last decade, which have been famously lambasted by Edward Tufte and others. Powerpoint is simply a tool, which can be used to good or bad effect. I didn't know about the Lincoln speech decomposition and it's cool! Had these men delivered their speeches with power point they would not have been famous. Power point would have dulled the passion in the speech. 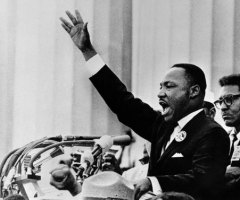 On the 50th anniversary of MLK’s famous speech, I delivered part of his speech using PowerPoint to show my colleagues how NOT to present… PowerPoint can kill even the best content.